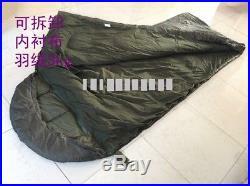 05's series China PLA Military Green Sleeping Bag Sleeping Bag, NEW. 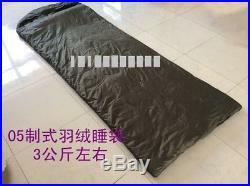 Sleeping bag outside fabric: 240D Camouflage Thicken PU Oxford cloth Waterproof fabric. Sleeping bag lining Color: Military Green or Black. 0% Feather And Down, 3. 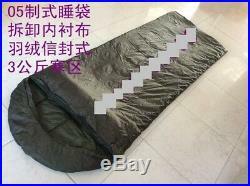 Sleeping Bag Size:Length Size: 210 cm, Width Size: 80 cm. Sleeping Bag Features: Sleeping bag mezzanine can be removed. Soft, Feel comfortable, Good thermal properties, maintain the temperature, Easy cleaning. 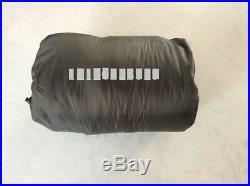 Sleeping Bag is original packaging, unused, NEW. Made in China PLA Military Factory. (1) Please tell me, what items do you need? Because sent one registered package to canada, the weight of one registered package can not be more than 2 kilogram, if items weighing more than 2 kilogram, need sent 2 registered package or more registered package. (1) USA, Australia, Turkey, Spain, Greece, Luxembourg, Croatia, Czech Republic, Monaco, Lithuania, Slovenia, Slovakia, Italy, Hungary, Sweden, Poland, Finland, Denmark, Vatican, Malta, Cyprus, Serbia, Bulgaria, Estonia, Latvia, Romania, United Kingdom, France, Germany, Austria, Ireland, the Netherlands, Belgium, Russia, Norway, Canada, Serbia, Saudi Arabia, Israel, item sent to the above countries or area, item sent the after, normal situation about 10. Arrive, accident situation exceed 60. (2) Singapore, Japan, South Korea, Hong Kong, item sent to the above countries or area, item sent the after, normal situation about 3. (1) Sent to USA and canada and Saudi Arabia and Israel, the weight of one registered package can not be more than 2 kilogram, if items weighing more than 2 kilogram, need sent 2 registered package or more registered package. (2) Sent to Australia, the weight of one registered package can not be more than 25 kilogram, if items weighing more than 25 kilogram, need sent 2 registered package or more registered package. (3) Sent to Turkey, Spain, Greece, Luxembourg, Croatia, Czech Republic, Monaco, Lithuania, Slovenia, Slovakia, Italy, Hungary, Sweden, Poland, Finland, Denmark, Vatican, Malta, Cyprus, Serbia, Bulgaria, Estonia, Latvia, Romania, United Kingdom, France, Germany, Austria, Ireland, the Netherlands, Belgium, Russia, Norway, Serbia, the weight of one registered package can not be more than 30 kilogram, if items weighing more than 30 kilogram, need sent 2 registered package or more registered package. Feedback : If you are satisfied with me items and services, please take a moment to leave positive 5 feedback for me, please help me. And Wish You A Good Luck! 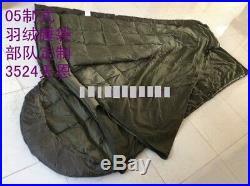 The item "05's series China PLA Military Green Sleeping Bag, -20 0" is in sale since Saturday, October 28, 2017. This item is in the category "Collectibles\Militaria\Current Militaria (2001-Now)\Original Items\Personal, Field Gear\Bags & Packs". 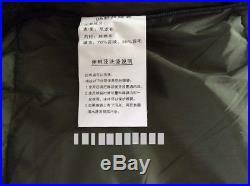 The seller is "army6688" and is located in Suzhou,Jiangsu.